When my soup recipes start making their way to the front of my recipe file, I know that cooler weather and autumn are on their way. I love the inviting aroma of savory soups simmering over a warm stove. I select my soup recipes based on a number of factors. To make a good, nourishing soup, the soup recipes need to not only be tasty, but they also have to be easy. And, of course, the soup recipes should include a nutrient-dense broth as a base. 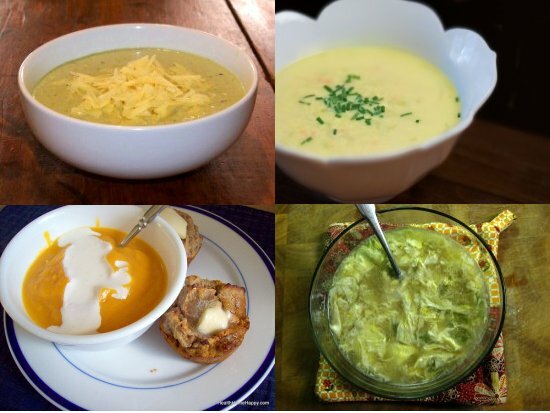 The following collection of soup recipes will warm your home and your belly. This soup is old-fashioned comfort food. The first time I ever ate a cheese soup I was a child eating a fine dinner at a German restaurant to celebrate my father’s birthday. The dining room featured dark woods, a stone hearth sporting a happy fire, copper pots hanging on the walls, and mahogany colored leather on the chairs. Rustic. 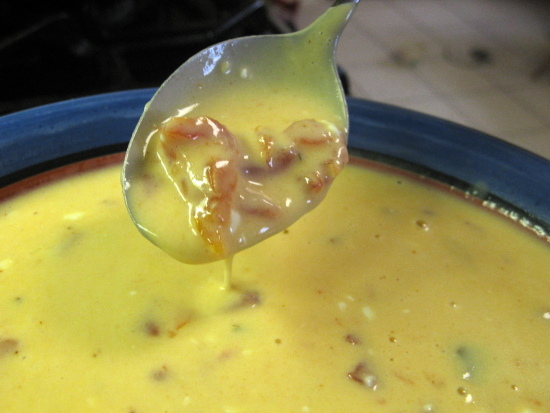 Cheese soups are rustic soups, and I love them. You know you need a Real version of this popular soup. You can’t, in good conscience, buy it at the supermarket when it comes loaded with MSG in BPA-lined cans. Herbal, earthy, and nutrient-dense, this soup isn’t thickened with flour, but egg yolks! 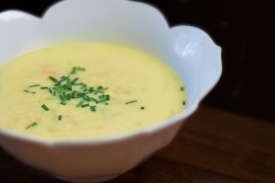 Don’t you just love soup recipes from old cookbooks? Everything’s so…real. Fast. Fast. Fast. Easy. Easy. Easy. This soup cooks up so quickly, it has saved many a dinner. And it’s also nourishing, too. Eggs from pastured hens. Homemade chicken broth. What’s not to love? This is one of my easiest soup recipes to make. The delicately sweet flavor of butternut squash mingles with the curried flavor of ginger in this warm Autumn soup topped with cultured cream. Fresh butternut squash straight from the farmer’s market is inexpensive at this time of year, so dig in. Nice soup collection. Mmmm Broccoli Cheddar. Definitely my favorite of the bunch. Bookmarked for this weekend. These soups look so tasty. I love soup and I am excited to be able to enjoy them as the weather gets cooler. I have never tried the egg drop and it looks very interesting. I also think that we may have some of the same set of dishes. I have the same bowls as the one that you have the chicken cream soup in with the petals. I think they are beautiful and fun to eat out of. Where did you get your dishes? I am looking to find some that are like that in serving size, but I don’t know where to find them. I love soup and these soup recipes look delicious. I make a Chinese hot and sour soup quite often. It’s one of my favorites. I’ll have to try your egg drop recipe though. Have you posted the recipe for your hot & sour soup anywhere? I would *love* to try it. Funnily enough today I was planning on making a pot of soup (even though we are heading into summer here in NZ) with my bone broth that has been sitting in the fridge for a couple of days. We need a quick meal tonight as we are out at a school music function, the soup I made which was just a collection of veges sauteed in butter and then bone broth, needed a bit of a lift so I grated in heaps of fresh ginger and the juice of two lemons and it is really really nice. I will definitely try some of yours though. These soups look delicious. I just made chicken stock yesterday, I’ll have to try these. Especially the Cream of Chicken Soup looks delicious! We just finished a dinner of homemade beef stock with sprouted beans which I thickened with the six egg yolks that were called for in the cream of chicken soup recipe above. It was wonderful! SO wonderful that I would like to make it a regular thing but I am wondering about accumulating so many eggs whites. I know about meringues (but never tired them) want to do some more macaroons and remember something in NT about using them to purify stock. Isn’t there something not so healthy about consuming egg whites alone– or is that just when they are raw? Any other healthy ways of using egg whites?? Hi Katie — I think the egg white restriction is usually only made when they’re raw. (And even then, I wouldn’t be too worried if you’re eating a nutrient dense diet.) If you eat grains, you can whip egg whites into peaks and then fold them into quickbread batters (like pancakes) to make them fluffier. You can add them to your omelettes to get more protein into the meal. And, if you don’t mind them being raw, you can add them to smoothies. These soups all look delicious! 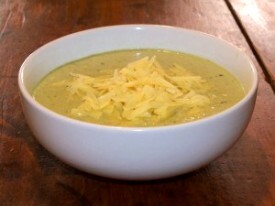 I love soups and have been looking for some new recipes so I’m happy I cam across your blog :)Thanks for posting these! I think my next experiment will be broccoli and cheddar, mmmm. 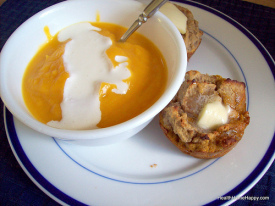 I make creamy tomato soup with butternut squash. I chop it, cook it in chicken broth then mix it together with roasted tomato (w/ garlic & basil) tomato sauce. It’s the smoothest, creamiest tomato soup and I love love love it! Homemade soups are the best. I think I’ll try the cheddar broccoli and creamy chicken recipes you shared here. Thanks! Homemade potato mushroom soup with carrots and onions!